Recorded and mixed at Le Studio, Morin Heights, Quebec during October and November, of 1980. Red Barchetta inspired by ‘A Nice Morning Drive’, by Richard S. Foster. Witch Hunt, part III of ‘Fear’. One of my favourite Rush albums, usually a favourite for almost all fans. Rush’s most mainstream album (after 2112) delivers in practically every song. Peart’s drumming and lyrics are incredible, added along with Alex’s driving solos and effects, and Geddy’s strong singing with a good use of bass/synth/pedals/OB-X. Red Barchetta: Opening with some harmonics, and some light synth and Peart’s cymbal tapping. The song drives through with lyrics and sound that feels almost like a real car chase in the future where the “motor law” changes the way of driving. The song in its entirety goes full circle and ends where it began. YYZ: The instrumental (The first one since “La Villa Strangiato” on Hemispheres). Starts with the band playing in Morse Code spelling “YYZ”. The song has repeating sections, but with Bass and Drum alternating solos before Alex gets his solo in. Song repeats the same ’till the end and a quick “di-da-de-dum” ending the song. Limelight: Peart’s lyrics do justice in describing mainstream success (ironic, because of how popular the song became) and really “living in the limelight”. Alex does some very nice and slow soloing along with some drum soloing from Peart all the way to the Outro. Ends strong with some synth trailing with Peart’s drumming. The Camera Eye: Rush’s last extended piece (as of now). My favourite track on the album. Some Oberheim combined with OB-X thrown in to open the track. Peart’s starts tapping on the snare and Alex does some more harmonics. Space-Synth is present in the main portion of the song. Then the rhythm changes and synth opens the next section. The lyrics describe our first destination, New York. Peart describes the intricacies of both here and London in the verses. The song remains constant the entire time from the beginning to the end. Witch Hunt (Part III of Fear): The first song of the “Fear” series that succeeds on the next 2 albums. The song is very quiet for about the first 1 1/2 minutes, then kicks into some very creepy lyrics and strange guitar riff-age. The song is very irregular in terms of structure and sectioning. It currently remains my least favourite song on the album (I really shouldn’t have a favourite and least favourite when it comes to RUSH). Peart’s drumming is really key in this song as there are a variety of different sounds he makes. Vital Signs: A “last minute” song for the album, and put in the proper place. Geddy runs his OB-X while Alex has some channel shifting while hitting staccato chords. Peart’s lyrics are very static and describe human nature in general, and about “being different”. Peart’s drumming is very reggae as is the song itself. And the song continues until the very end, with Geddy slightly changing the repeated line (that’s said throughout the song) each time “Everybody got to ________ from the norm”. The line is catchy in itself. And the song fades out with the song still driving and concludes the album. Moving Pictures is a masterpiece within itself. 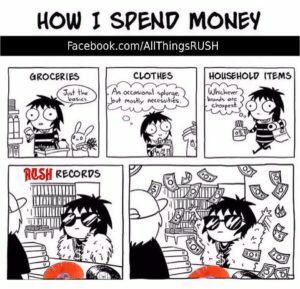 It’s a well-planned, well-written, well-recorded album that has songs that still remain in Rush’s live setlists to this day (The Time Machine tour played it in full and was a very enjoyable experience for me). It remains on my list of favourite albums and I believe is one of the best albums of the 80’s. I give it 5 stars for its composition and genius. I feel that Moving Pictures will stay a classic album for a very long time into the future.